What are risk factors for age-related macular degeneration? What are macular degeneration symptoms? What are signs of macular degeneration? What type of specialist treats macular degeneration? What tests do health care professionals use to diagnose macular degeneration? What are complications of macular degeneration? What is the prognosis for macular degeneration? What research is being done on macular degeneration? AMD is a painless condition. Smoking, high blood pressure, obesity, a diet high in unsaturated fats and simple carbohydrates and lack of exercise all increase the risk of AMD. Early symptoms of dry AMD include slightly blurred vision, the need for more light for reading, and difficulty recognizing faces until very close to the person. A symptom of more advanced dry AMD is the presence of a blurred spot in the center of vision. An early symptom of wet AMD is the wavy appearance of straight lines. Dry AMD cannot be treated at present, but progression can be slowed through a healthy lifestyle and sometimes with antioxidant vitamins. Injections into the eye of anti-angiogenic agents are successfully being used in arresting or slowing wet AMD. Because of new therapies for the wet form of AMD, early diagnosis of wet AMD is particularly essential. Macular degeneration is a common, painless eye condition in which the central portion of the retina deteriorates and does not function adequately. The retina is the light sensitive tissue located in the back of the eye. It is like the film in a camera, recording the images we see and sending them via the optic nerve from the eye to the brain. The retina almost instantly converts light images into electrical impulses through a chemical reaction. The retina then sends these impulses or signal, to the brain, where we interpret what we see, process the visual information, and relate what we see to the rest of our environment. The macula is a small portion of the retina located in the central portion of the retina. The macula is responsible for central vision (straight-ahead vision) and provides the ability to see fine detail in your direct line of sight. We use the macula of each eye to have the clear vision that allows us to read, drive a car, and recognize faces or colors. The non-macular areas of the retina provide us with our side vision and best night vision. While there are many causes of macular degeneration, including genetic abnormalities such as Stargardt disease, age-related macular degeneration (AMD or ARMD) is by far the most common type. AMD is a disease associated with aging that gradually destroys sharp central vision that is needed for seeing objects clearly and for common daily tasks such as reading and driving. In some cases, AMD advances so slowly that people notice little change in their vision. In others, the disease progresses faster and may lead to a loss of vision in one or both eyes. AMD is the leading cause of vision loss in Americans 60 years of age and older. AMD usually affects both eyes, although the clinical appearance and degree of visual loss may vary a great deal between the two eyes. AMD occurs in two forms. "Wet" age-related macular degeneration is less common but more aggressive in its progression to severe central vision loss. "Dry" age-related macular degeneration is the more common type and is more slowly progressive in causing visual loss. AMD may be classified as to its severity using terms such as mild, moderate, or severe. These terms are subjective and not based on specific characteristics. Wet AMD occurs when abnormal blood vessels grow from the choroid (the layer of blood vessels between the retina and the outer firm coat of the eye called the sclera) under and into the macular portion of the retina. These new blood vessels (known as choroidal neovascularization or CNV) tend to be very fragile and often leak blood and fluid. The blood and fluid raise the macula from its normal place at the back of the eye and interfere with the retina's function and causes the central vision to blur. Under these circumstances, vision loss may be rapid and severe. Some patients, however, do not notice visual changes despite the onset of CNV. Therefore, periodic eye examinations are very important for patients at risk for CNV. Once CNV has developed in one eye, whether there is a visual loss or not, the other eye is at relatively high risk for the same change. All wet AMD is potentially a cause of significant visual loss, whether or not there is major visual decrease at the time of diagnosis. Wet AMD does not have specific stages like dry AMD. The wet form generally leads to significantly more vision loss than the dry form. All people who have the dry form of AMD are at risk for development of the wet form. Most people who have the wet form had the dry form first. The dry form can advance and cause vision loss without turning into the wet form. The dry form also suddenly can turn into the wet form. Currently, there is no certain way to predict if or when the dry form will turn into the wet form. Retinal drusen are yellow deposits under the retina. They often are found in people over 60 years of age. Your eye care professional can detect drusen during a comprehensive dilated eye exam. Drusen alone do not usually cause vision loss. In fact, scientists are unclear about the connection between drusen and AMD. It is not clear if an increase in the size or number of drusen raises a person's risk of developing either advanced dry AMD or wet AMD. In dry AMD, the light sensitive cells in the macula slowly break down. With less of the macula functioning, central vision diminishes. Dry AMD often occurs in just one eye at first. Later, the other eye can be affected. The cause of dry AMD is unknown. Dry AMD has three stages (early, intermediate, or advanced), all of which may occur in one or both eyes. These are defined by the amount and characteristics of the drusen that are present. People with early AMD have either several small drusen or a few medium-sized drusen. At this stage, there are no symptoms and no vision loss. The dry form is much more common than the wet form. In dry AMD, there is no CNV (abnormal new blood vessel formation under the retina) and no fluid or blood leakage into the retina (retinal swelling or bleeding). More than 85% of all people with intermediate and advanced AMD combined have the dry form. However, if only advanced AMD is considered, about two-thirds of patients have the wet form. Dry AMD can advance and cause vision loss without turning into wet AMD. Dry AMD can also rapidly transform into the wet form by the growth of new blood vessels. We do not know the precise cause for the development of AMD or ARMD. However, we do know that there are certain risk factors for the development of age-related macular degeneration. The greatest risk factor is age. Although AMD may occur during middle age, studies show that people over age 60 are clearly at greater risk than other age groups. Middle-aged people have about a 2% risk of getting AMD while people over age 75 have a nearly 30% risk. Other risk factors include smoking, obesity, white race, female gender, a family history of macular degeneration, a diet low in fruit and vegetables, high blood pressure, and elevated blood cholesterol. Neither dry nor wet AMD cause any eye pain. The most common early symptom in dry AMD is blurred vision. As fewer cells in the macula are able to function, people will see details less clearly in front of them, such as faces or words in a book. Often this blurred vision will go away in brighter light. If the loss of these light-sensing cells becomes great, people may see a small black or gray blind spot in the middle of their field of vision. Dry macular degeneration symptoms usually develop gradually and do not include total blindness. However, the symptoms may worsen the quality of life by making reading, driving, and facial recognition difficult. Other symptoms may include decreased night vision, a decrease in the intensity or brightness of colors and increase in the haziness of overall vision. Dry macular degeneration may affect one eye or both eyes. If only one eye is affected, symptoms may not be noticed because the unaffected eye has no visual symptoms. All of the above symptoms may also be noticed in the wet form of AMD. In addition, the most common symptom in wet macular degeneration is straight lines appearing crooked or wavy. This results when fluid from the leaking blood vessels gathers within and lifts the macula, distorting vision. Larger areas of gray or black in the central area of vision may also occur. The central vision may decrease over a short period of time. In both dry and wet forms of macular degeneration, the ophthalmologist may find decreased visual clarity (acuity) with preservation of peripheral vision and changes in the central retina visible with the ophthalmoscope. Areas of atrophic retina may be seen in the macula by the ophthalmologist in both dry and wet forms of the disease. Fluid or exudative material under or within the retina may be noted in wet forms of macular degeneration. The diagnosis of macular degeneration can be made by an ophthalmologist or optometrist. An ophthalmologist is a medical doctor who has specialized in the diagnosis and medical/surgical treatment of eye disease. In order to diagnose macular degeneration, the pupils are dilated with eyedrops so that the retina can be clearly seen. Once the diagnosis of macular degeneration is made, distinguishing between the dry or wet variety can be made by any ophthalmologist. If you are found to have wet macular degeneration by a non-ophthalmologist, you may be referred to an ophthalmologist specializing in vitreo-retinal diseases. The majority of patients in the United States who are being treated with intravitreal injections for wet AMD are cared for by vitreo-retinal subspecialists. Your ophthalmologist may suspect the diagnosis of AMD if you are over age 60 and have had recent changes in your central vision. To look for signs of the disease, he or she will use eyedrops to dilate, or enlarge, your pupils. Dilating the pupils allows your ophthalmologist to view the back of the eye better. Early AMD is often diagnosed during a comprehensive eye exam in patients without significant symptoms. This eye exam includes having drops placed in your eyes to enlarge, or dilate, the pupils. 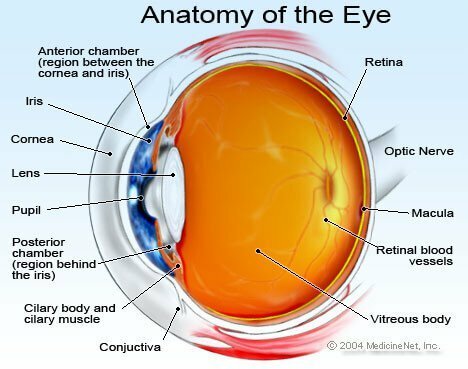 Your ophthalmologist will carefully examine the central portion of the retina to determine the presence or absence of AMD using various illuminating and magnifying devices. During the eye exam, you may be asked to look at a checkerboard pattern called an Amsler grid. When looking at an Amsler grid with one eye, patients with AMD may notice that the straight lines of the checkerboard appear wavy or are missing. Other diagnostic tests that your ophthalmologist may perform include retinal photography, fluorescein angiography and optical coherence tomography. All of these can help to differentiate between dry and wet forms of AMD and also document the abnormalities so that progression and response to treatment can be better measured. Wet AMD can be treated with laser surgery, photodynamic therapy, and injections into the eye. None of these treatments is a permanent cure for wet AMD. The disease and loss of vision may progress despite treatment. Laser surgery in the form of photocoagulation is used to destroy the fragile, leaky blood vessels. A high energy beam of light is aimed directly onto the new blood vessels to eradicate them, preventing further loss of vision. However, laser treatment may also destroy some surrounding healthy tissue and some vision. Because of this, only eyes with new vessels away from the exact center of the vision can be treated. This represents only a small proportion of patients with AMD. Laser surgery is only effective in halting or slowing visual loss if the leaky blood vessels have developed away from the fovea, the central part of the macula. Even in treated cases, the risk of new blood vessels recurring after treatment is significant and further or other treatment may be necessary. Photodynamic therapy uses a drug called verteporfin (Visudyne) that is being injected into a vein of the arm. A light of a specific wavelength is then directed into the eye to activate the drug adhering to the blood vessels in the eye. The activated drug destroys the new blood vessels and leads to a slower rate of vision decline. Photodynamic therapy may slow the rate of vision loss. It does not stop vision loss or restore vision in eyes already damaged by advanced AMD. Treatment results often are temporary. Retreatment may be necessary. Within the last 11 years, injections into the eye with drugs specifically developed to stop the growth of new blood vessels have revolutionized the treatment of wet macular degeneration and have become the mainstay of treatment of wet macular degeneration. We have learned that a specific chemical called vascular endothelial growth factor (VEGF) is necessary for the new blood vessels to grow under the retina. Drugs that counter VEGF (anti-VEGF pharmacotherapy) can be injected into the eye to arrest development of new blood vessels and sometimes cause them to regress. These drugs include Eylea (aflibercept) and Lucentis (ranibizumab), both approved by the FDA for this indication, and Avastin (bevacizumab), which is unapproved by the FDA for injection into the eye and requires compounding by a specialized pharmacy. Some physicians preferentially use Avastin because of its much lower cost. These drugs are injected into the vitreous of the eye in the ophthalmologist's office and may need to be given as frequently as monthly. Careful observation of the eye on a monthly basis to determine the drug effect is necessary in the case of Lucentis and every other month in the case of Eylea. With this treatment, visual loss can often be halted or slowed and some patients will even experience some improvement of vision. Newer drugs currently under review may need to be given less frequently. Photodynamic therapy and laser ablation have been largely, if not completely, abandoned in favor of VEGF inhibitors. New and more effective anti-VEGF medicines, including drugs that counter platelet derived growth factors and angiopoietins are currently in clinical trials and approaching the market. If diagnosed and treated early, the patient's chances of a better outcome are improved. In patients with far advanced macular degeneration on both eyes, surgery to implant a telescopic lens in one eye is an option. The telescope implant, which surgically replaces the eye's natural lens, magnifies images while reducing the field of vision (peripheral vision). The telescopic lens implant may improve both distance and close-up central vision. There is currently no treatment available to reverse dry macular degeneration. However, dry macular degeneration is usually slowly progressive and most patients with this condition are able to live relatively normal, productive lives. Often one eye is affected more than the other. Once dry AMD reaches the advanced stage, no form of treatment can prevent further vision loss. However, treatment can delay and possibly prevent intermediate AMD from progressing to the advanced stage of severe vision loss. The National Eye Institute's Age-Related Eye Disease Study (AREDS and AREDS2) found that taking a specific high-dose formulation of antioxidants and zinc significantly reduces the risk of advanced AMD and its associated vision loss. Slowing AMD's progression from the intermediate stage to the advanced stage is helpful in reducing the progression of visual loss in many people. In this study, researchers used an antioxidant formulation that included vitamin C, vitamin E, beta carotene (or vitamin A), and zinc. For people with early-stage dry macular degeneration, there is no evidence that these vitamins provide a benefit. It is recommended that people with intermediate-stage dry AMD in one or both eyes or advanced stage AMD (dry or wet) in one eye, but not the other eye, take the AREDS formulation. Patients with increased risk of lung cancer should not take beta carotene. Studies involving other supplements such as lutein, zeaxanthin, other carotenoids, black currant, and bilberry are currently under way. The progression of dry age-related macular degeneration can also be slowed through lifestyle changes. These include changing the diet to include more fruits and vegetable, choosing healthy unsaturated fats, such as olive oil, over unhealthy saturated fats, such as butter, eating whole grains rather than refined grains and adding fish high in omega-3 fatty acids. Progression to wet macular degeneration is the main complication of dry age-related macular degeneration. At any time, dry macular degeneration can progress to the more severe form of the disease called wet macular degeneration, which may cause rapid vision loss. There is no accurate way to predict who will eventually develop wet macular degeneration. Other eye diseases such as cataracts, glaucoma, retinal detachment, or dry eyes are not complications of macular degeneration. Patients with macular degeneration can, however, develop these or other eye diseases and people with these conditions can also develop AMD concurrently. Macular degeneration in its advanced form can cause loss of all central vision in both eyes. In the absence of other eye diseases, peripheral vision is maintained. Therefore, patients with advanced macular degeneration are, in most cases, able to see enough to get around within familiar surroundings. The use of magnifying devices can often improve vision in macular degeneration to allow for reading or watching of television. Your lifestyle can play a role in reducing your risk of developing AMD. Eating a healthy diet high in green leafy vegetables and fish, not smoking, maintaining blood pressure and weight at normal levels, and engaging in regular moderate exercise can be helpful in prevention of macular degeneration. There is a large amount of research currently being performed to increase our understanding of the basic molecular mechanisms of macular degeneration. These include evaluation of families with a history of AMD to understand genetic and hereditary factors that may cause the disease. There are multiple drugs and devices presently in various phases of clinical trials to both prevent and treat macular degeneration. These include new drugs to prevent new blood vessel formation, certain anti-inflammatory treatments for the wet form of AMD, and drug-delivery systems to reduce the need for frequent injections for the wet form of macular degeneration. The possibility of transplantation of transplanting healthy cells into a diseased retina is also being investigated. American Academy of Ophthalmology. "Age-Related Macular Degeneration PPP -- Updated 2015." January 2015. <https://www.aao.org/preferred-practice-pattern/age-related-macular-degeneration-ppp-2015>.